You know I’m a fan of using stories as a way to talk about the hard stuff (check out the recent addition of my sci-fi alter ego). But did you know stories are also a fabulous marketing tool? It’s true. People remember stories. People seek out stories to see and hear every single day (movies, books, and even that gossip website you visit on the sly). And when you know who the Hero of your story is, what villains they’re battling, and what kind of goal they’re after, you can create clear, confident messages that connect you directly to the right people. Your right people. The people who want and need what you offer. And that leads to more profit. When I started my business I didn’t tell stories. I named my business Small Business Finance Forum. Ugh. Doesn’t that name just make you want to run away or fall asleep. There were no mascots or villains. No stories. And guess what? There wasn’t much business coming in either. My clients told me they hired me in spite of my marketing and branding, not because of it. Fortunately I had friends and colleagues who helped me understand why my approach wasn’t working. They supported and encouraged me to stop hiding my story telling skills and start leveraging them. A key person in that transition to better marketing and more profit has been my friend and colleague, Tea Silvestre (of Story Bistro infamy). Now you have a chance to work directly with Tea. Tea is hosting her 2nd Annual Storytelling Soiree for Small Biz Owners this August. 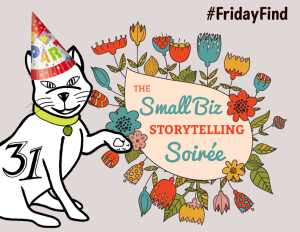 If you’re in Portland Oregon this summer (or you want to be), go check out the details: http://storybistro.com/small-biz-storytelling-soiree/. And — BONUS — she’s given me a sweet discount code to share just with you. Use NUMBERSPAL25 when you check out before July 1st and you’ll save 25% off the ticket price. Newsflash: The interwebz are full of cool stuff. While I make an effort to share anything helpful or interesting through social media, there are always a few stand out items. It might be an app, a service, a coffee mug (I take my coffee very seriously), a podcast, a group making the world better, or just something that got added to my must have / must do list. #FridayFind is my weekly spotlight on that one stand out. Enjoy.